So you’re deciding whether to head for Confitura 2019… Learn what’s behind the scenes from the major sponsor of Confitura Java Conference. Should an “ordinary” Java developer attend Confitura (or Konfitura) and what to expect? Softwareplant’s chill out zone at 2017 Confitura deserved a recognition. Breakfast, lunch and coffee was free for each Confitura visitor. See you on the 29th of June 2019. 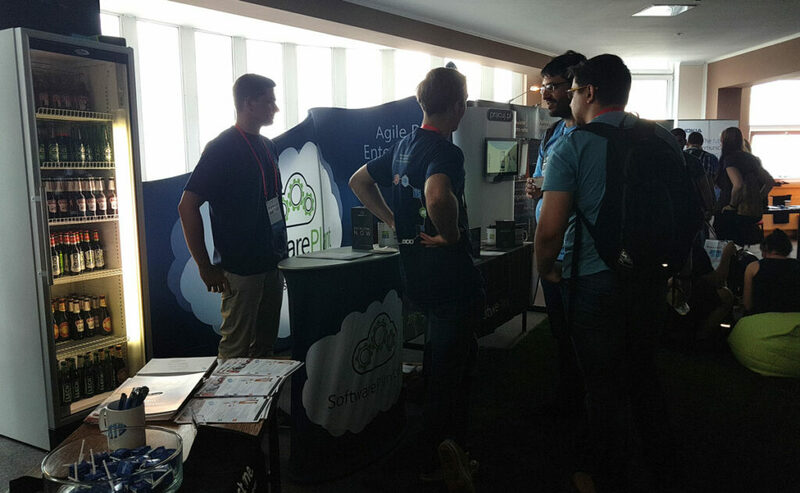 SoftwarePlant booth, we seek developers for our falgship BigPicture. Table football and a freezer full of cold beer. Recruitment marketing in full swing. 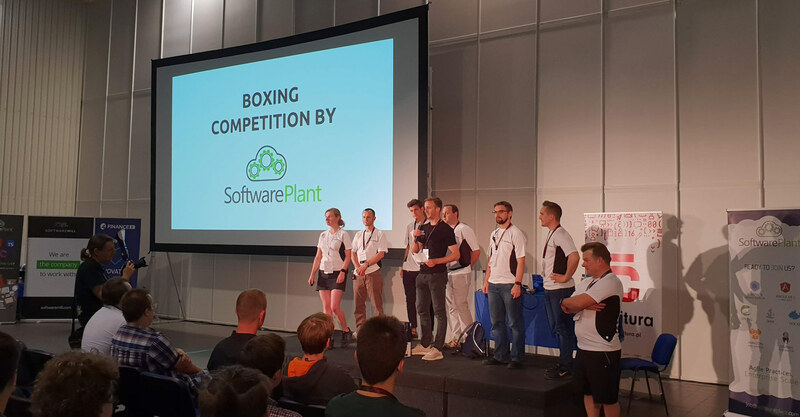 SoftwarePlant promotes physical education: those brave enough to box could win a PS4 console. We’re browsing job applications. You could also apply now! We collected quite a few promising job applications. Where: Bobrowiecka Conference Center, ul. Bobrowiecka 9, Warszawa. 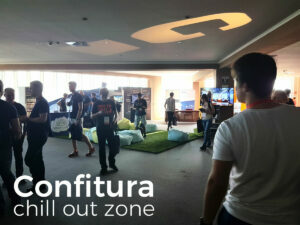 Softwareplant’s chill out zone (pictured) at Confitura 2017 deserved a recognition. As a Platinum sponsor SoftwarePlant arranged a photo contest (check photos people submitted): take a selfie in a photo booth; a beer for everyone; a drone or a Flyspot ride for winners. We, as the Platinum Confitura sponsor. Giant bean bags next to SoftwarePlant’s sponsor stand. The store fridge to the left filled with bottles of beer that were given away to those who submitted the selfie. As the platinum sponsor we organized the contest. Those who submitted a selfie could win the drone and the Flyspot ride. Check out the submitted photos. Is it worth going to Confitura? From a Java engineer from Poland point of view, Confitura is certainly essential. People from around Poland – Kraków, Gdańsk and Poznań arrive. The presentations truly introduce those not-widely known still handy technologies; speakers are extremely competent. Breakfast, lunch and coffee is included, e.g. sponsored by Platinum and Gold sponsors. It’s an opportunity to socialize and get in touch with university friends. Java developers. Both beginners and advanced programmers as the lectures are accordingly labeled. Employers looking for Java programmers. is an evening party for the Java crowd, aimed at socializing. SPOINa ‘2017 took place on a barge moored in the Vistula River. Reasonable doses of alcohol available. Lots of tasty snacks. Entrance to SPOINa is included in the aforementioned fee. Great opportunity to chill out. So, is it worth to educate yourself in Java? We believe Java is currently the most popular language for web applications. Try googling the “programming languages popularity” key phrase. Any issue you may encounter while coding Java has probably been discussed on stackoverflow.com. Millions of Java-based applications exist out there and thousands of job offers, too. Java is similar to C# and C++. Banking industry heavily uses Java. And all other industries, too, for its scalability, speed and security. Our DevOps Manager’s recommendation for beginners: learn Java twelve hours a day for three months and look around for your first programming job. Udemy, Codecademy, Pluralsight make some valuable sources of training courses. Polish programmers rank 3rd in the world, according to Which Country Would Win in the Programming Olympics? by hackerrank.com. 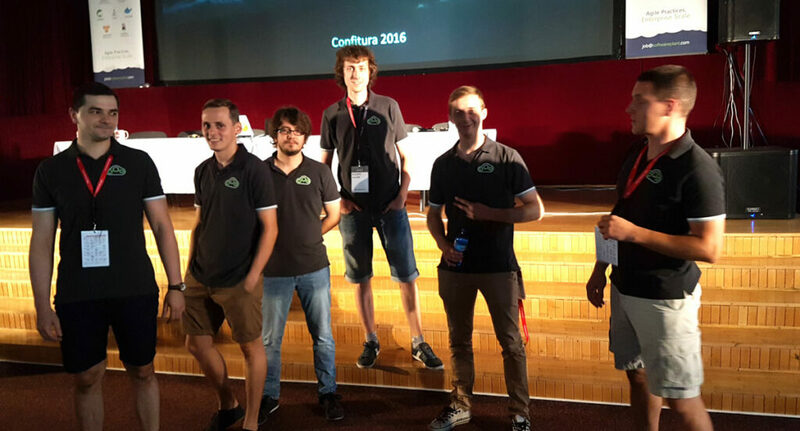 SoftwarePlant Java developers at Confitura 2016. Tom Kucharski, SoftwarePlant’s CEO delivering the “Common code for cloud and server” presentation. Confitura is largely a Polish language event.